"My husband and I found our yoga lessons with MA&Y to be excellent and inspiring. The teachers cover a number of different postures, keeping it fun and interesting. Unlike other classes we have been to, the teachers have a real ability to teach. The lessons are interactive and personalised. Whilst the lessons are physically challenging, the teachers encourage us to develop a greater awareness of our bodies and develop a new understanding of the relationship between the mind and body rather than pure attainment of fitness. We would recommend the lessons with Gaia to anyone and everyone!" 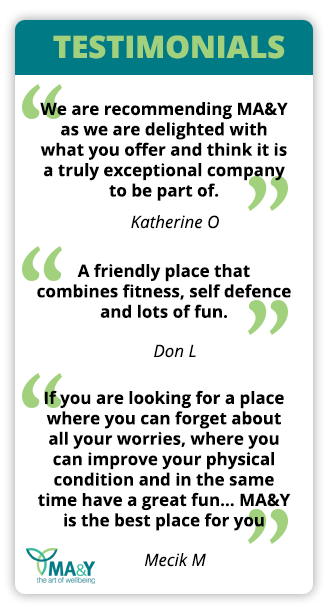 Look great, feel great, be great with adult Yoga classes from Martial Arts and Yoga in Earlsfield and Wimbledon Park. Improve your health, physical fitness and overall well being while having fun in a safe, energetic environment. We are more than just fitness classes...we are a way of life! Martial Arts and Yoga classes consist of Hatha Yoga practice open to all levels, ESPECIALLY beginners. There is an emphasis on alignment and breathing, as well as faster paced Vinyasa flow. These classes are tailored to each individual, so each yogi and yogini can develop at his/her own pace. Breathwork and meditation are also included. No matter what your age, this programme will give you a sense of peace, beauty, and joy that cannot be explained in words. As you break through your physical barriers and limitations, your mental barriers will melt away, leaving your mind more alert, calm, efficient and open. Another great thing about Martial Arts and Yoga is that we employ both men and women as instructors so our students are comfortable and we receive input from everyone to make our classes safe, fun and unique. If you're feeling tired, sluggish, or looking older than your years, yoga can help you recharge and rejuvenate your mind, body and your life. PERFECT FOR ADULT MEN AND WOMEN OF ALL AGES! We welcome exchange, debate, and feedback on the classes to develop a deeper understanding of yoga in daily life. Yoga changes our daily behaviors and helps to overcome our quotidian struggles. Yoga is a way of life that gives strength, peace, clarity, balance, focus, centeredness and lets us act from a place of awareness. Yoga is the yoke, the connection between our material being and our true selves, and the most wonderful practice for an enlightened living. To learn more, please scroll up. On the right, you'll find a signup box where you can fill in your contact details and have information immediately sent to your inbox. We proudly serve Southfields, Wimbledon Park, Clapham, Putney, Wandsworth, Balham, Battersea, Waterloo, Vauxhall and MORE!